an award-winning series of animated shorts for "Sesame Street"
...Eric Weil (C'97. 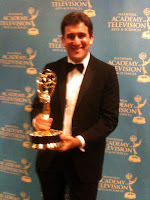 UTV-13 News, The Practical Penn (Restaurant Reviews) won an Emmy. Eric was honored with his first Emmy, for Writing in Animation for the PBS Kids literacy series "Word World" at the 36th Daytime Emmy Awards, Creative Arts and Entertainment ceremony. (Penn alumni tidbit: - the Senior Director/ Vice President of Children's Programming at PBS is Linda Simensky, C'85). "Interning and working briefly in advertising after Penn taught me many useful lessons about writing as well as working with clients and colleagues. But I can't overstate the value of my three years working in production on a Nick Jr. animated series, the Bill Cosby-created "Little Bill." Mr. Cosby had spoken at my class graduation in '97, so I took the opportunity to join his then-new show the next year as an encouraging sign. I had been interested in children's television for a while, but the timing seemed as right as it could ever be. While with the show I got to work as an assistant to the producers, a voice-director for the child performers and eventually, a writer. Besides gaining insights about producing, writing, directing and the media industry that I still use each day, the show introduced me to some talented and inspiring animators and directors that I've had the privilege to work with on multiple projects since, including many of my own. The Nick Jr. experience gave me the wherewithal to create and produce "Janie and Jerome," my series of 7 animated shorts for "Sesame Street" and its international co-productions. The awards and other flattering exposure that these films received on the film festival circuit gave me the credentials I needed to branch out into live-action production and serve other organizations that I cared about. I pitched a promotional "image" video idea to one such organization and somewhat to my surprise, they said yes. The project went well, a number of referrals followed and suddenly I had a business and the supreme privilege of working for myself. The Emmy I just won was a near-total surprise, as was the initial nomination, because it was for work I turned in nearly 2 1/2 years ago, just as I started focusing on my company full-time. The day I discovered I was nominated I was checking the Emmys website to see which of my friends I was going to congratulate on their nominations. My nomination appeared on the second-to-last page of a 60-page+ document. I didn't even know there was a category for Writing in Animation. Once I left advertising, the abiding goal of my career has been to pursue work that I could be passionate about and clients that I could understand instinctively. I love that my work allows me to learn about different kinds of people, businesses/community organizations, art forms and artists. Sometimes pursuing fun extra-curricular projects has helped me both professionally and personally. I've just begun my fifth Fall teaching a one-semester class for first-year Animation majors in the undergrad program at New York's School of Visual Arts. Among other benefits, I've received a first glimpse at dozens of talented and developing young artists. This year I even got to hire one of my first students to draw and animate for a corporate video project and unsurprisingly, she did wonderfully. I hope I've done right by my other students, too."